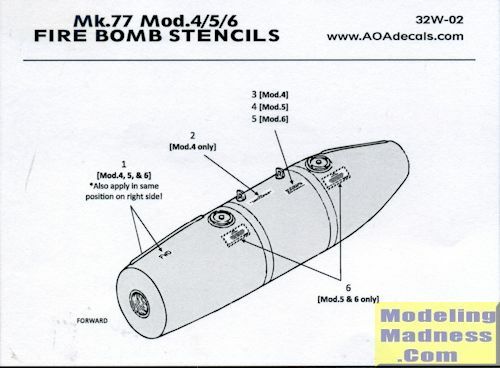 For their second weapons stencil set, AOA Decals has provided a sheet for the Mk.77 Fire Bombs (incorrectly called napalm bombs). The set includes markings for two bombs. There is a full placement guide provided and because these are Cartograf printed decals, you know you are getting some of the best. A nice addition to their decal line and one that I know big scale jet modelers will appreciate. Thanks to AOA Decals for the review sheet. You can find this sheet at this link.